“This is our way of saying thanks to the community – our supporters,” states Women’s Resource Center of Tampa, Inc. Event and Finance Chair Sandi de Laski in regard to the upcoming Palmer House Bed & Breakfast Christmas Stroll.Taking place on Saturday, December 5, from 7-9 p.m., Lithia’s Palmer House Christmas Stroll will be one of good times and socializing, led by the infectiously jovial Gail Palmer, who co-owns the residence with her husband Bob. Here, each one of the five suites as well as the main house at the bed and breakfast will be adorned with holiday décor, transformed into a wonderland of glimmering ornaments and prickly garland, candescent with lights and the smells of the holidays. A Christmas tree will take precedence in the main house, posing a striking entrance to onlookers. While hearing the tunes of local carolers throughout the grounds, guests can sample the Christmas drink wassail and palate delectable desserts. Having coordinated home tours in the past with her co-chair Ella Chadwell, de Laski mentions that the Christmas Stroll was forged as a nonprofit event to rid residents of the “hustle bustle feeling” of the season. Comments de Laski, “It’s an evening where a bunch of girlfriends or a husband and wife can come after dinner and really enjoy Christmas and all its wonders.” Supporting the Women’s Resource Center of Tampa, Inc. – a shelter serving some 100 women and their families monthly who have faced job loss, addiction, domestic violence, divorce and traumatic events – the stroll is hoped to welcome some 200-250 attendees. All will have the chance to enter a drawing for goodies and a stay at the Palmer House. Also, guests will be able to learn more about the shelter through a continuously run video seen on the Palmers’ flat screen as well as through attending Executive Director Cheryl English. 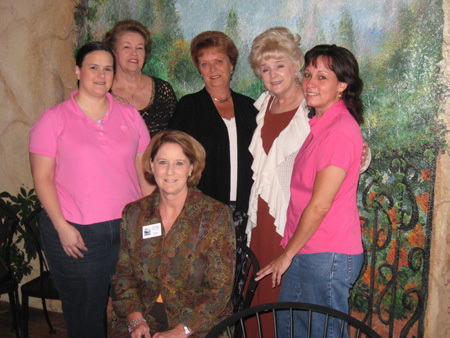 “My commitment was to put the Women’s Resource Center on the Brandon map. We are doing awesome things,” adds de Laski, who mentions the nonprofit’s future groundbreaking for 21 additional cottages to house 21 more families.Choosing a charity annually to aid, Gail says, “WRC is an outreach so needed this day and age, when things are tough and family and support are not enough. WRC is truly a spirit-led ministry. Come and be blessed as we support this cause.” Residents can purchase tickets to the Christmas Stroll for $10, with proceeds going towards refreshments and paper goods, by calling 220-1829. To learn more about the Women’s Resource Center of Tampa, Inc., visit www.wrctampa.org. Besides special events, the Palmer House is available for vacationers, weddings, baby showers, holiday parties and more. Located at 2221 Hinton Ranch Rd., residents can call 654-0961 or visit www.Palmer-House.com for more information.